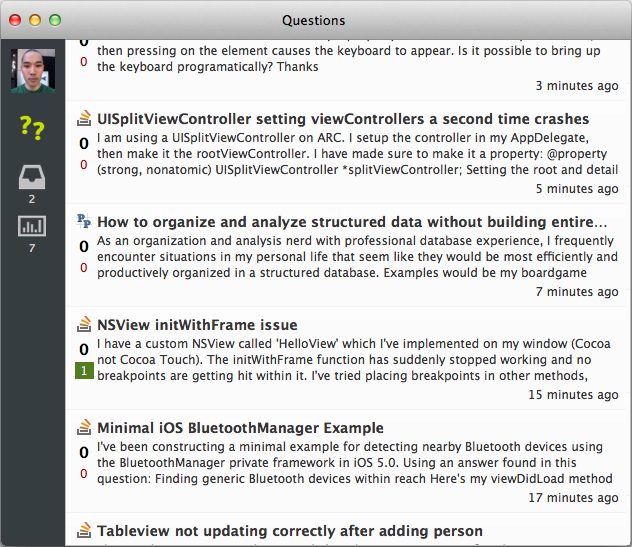 Bartlett is a Mac application that lets you keep track of the most recent questions, inbox items, and reputation items on your favorite Stack Exchange sites. You can be notified of new items by Growl notifications, dock icon highlighting, and the status bar icon. Since the API tends to be several minutes behind the website, I'm now scraping the website to get the latest questions. Several notification types, along with granular preferences so you can control which notifications you want for each type of item (questions/inbox items/reputation items). No worrying about the API quota anymore. Based on the number of sites and tags you watch, Bartlett will automatically adjust the fetch intervals. (But you might still run out if you repeatedly restarted the app or, even worse, repeatedly log in over and over). I'm also planning on cleaning up the UI to make it look better, and also show some more helpful information (like tags in the question view). 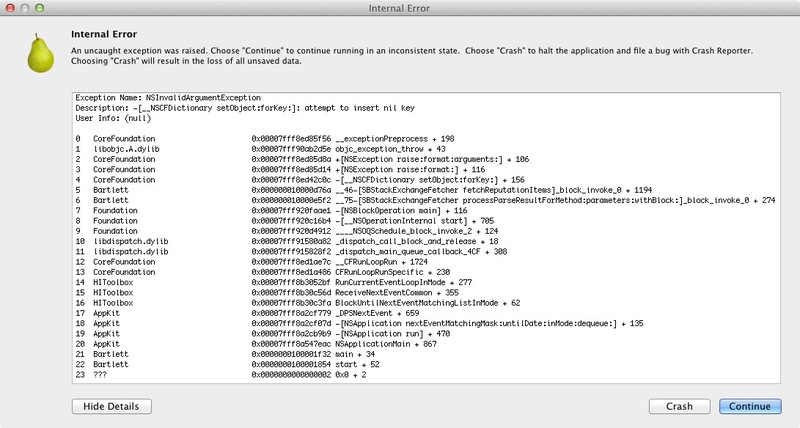 Mac OS X 10.6 and up. Undecided. I will probably open source it eventually, once I pay back all the technical debt I incurred trying to finish this in time for the contest. Here or on Twitter would be great. Great app so far! Your planned updates sound good as well. When I restart the app, the main window loads and it looks like it is trying to fetch questions, but it crashes again. Also, I notice that your post says the current version is 0.8.6, but the version I get when I follow your download link is 0.8.5. This happens every time a few seconds after I start Bartlett. Not the answer you're looking for? Browse other questions tagged app api-v2 mac-os-x .